Wow, feeling good about how we eat. Just taking the survey makes one feel validated. Could also see a check box for eating/adding more plant based entrees to your diet. Wish I could grow more food! I'm working on that. I wasn't surprised that eating more fruits and veggies, and drinking water, were the top methods of staying healthy. In fact, the top 50% answers seem to indicate that we primarily look to a variety of natural, whole foods as a way to ensure good nutrition. It was a bit surprising that supplements and vitamin-fortified foods were low on the list. Advertisers spend a lot of money convincing us that we can't get our daily requirements of vitamins and minerals via natural, whole foods alone. Seemingly healthy products, like fruit juices and whole-grain cereals are fortified with "essentials". We're told that we need these added ingredients to develop strong bones and resist illness. In thinking about it, however, I really shouldn't be surprised that green-living proponents view supplements and fortified foods as a last resort to improving nutrition. Those foods are processed, and processed foods use a tremendous amount of natural resources to produce. And in truth, it really makes no sense that a variety of organically grown foods wouldn't contain everything we need for optimal health. The best way to maintain good nutrition is to eat a wide range of organic, whole foods. If we remove things like processed foods, pesticides, and GMOs from the equation, we are left with healthy food. Food which will sustain and nourish us. The rest is not only unnecessary, but unhealthy. Last week we started a garden. Even though the calendar indicates that spring is here, many folks are still experiencing winter conditions. So it was a bit early to actually plant something ... but never too early to begin planning. In my area the days are warming up. In the last couple of weeks we've planted fruit trees, asparagus, strawberries, rhubarb, and potatoes. We've also started vegetable seeds in a mini greenhouse. It's an exciting time of year as everything begins to turn green. Christine makes a good point in this comment: "There is so much good that can be done with growing your own but so many people don't realise just what hard work it can be. You start in autumn by clearing back your vegetable patch and composting anything that isn't diseased as well as collecting leaves for leaf mould. You spend the winter digging over, digging in compost, repairing raised beds, cleaning out the greenhouse, pruning trees and fruit bushes, inspecting tools and cleaning out your shed, planning next year's crops, cleaning out seed trays and tubs. Come spring you plant out your seeds and crops then spend the summer weeding, feeding, watering and preserving what you can't eat instantly. And tending the compost heap. Come autumn you start all over again. Whoever said that gardening was easy or part time? 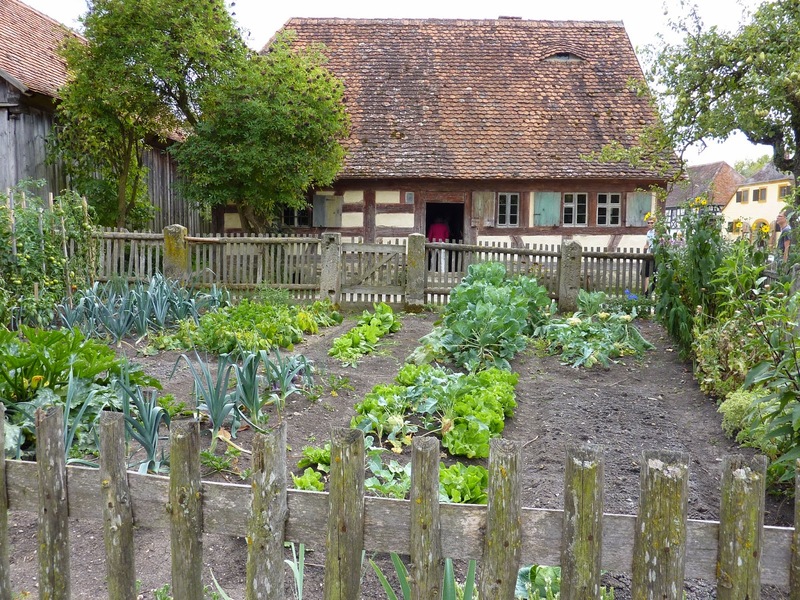 Many people take allotments or start vegetable gardens to be astonished at the work involved. It takes time, effort and is continual learning. But ever so rewarding." One of my favorite places to go for gardening inspiration is Aimee's (aka EcoGrrl's) blog. She's always got something growing. Curious about what's happening in her garden right now? Check out these POSTS. Scarlet very kindly included CTWW on her RebelMouse Page. You'll need to scroll down a ways to find the headlines. Be sure to check out all her content ... she includes some great articles on that page. piterson left a great comment on our Family Cook Day challenge: "Plastic products encompass a variety of additives, some of which (Adipate, Phthalates) can be toxic. They are durable and degrade very slowly; have an impact on climate change. So, raise your voice against plastic." Morag not only accepted the challenge, she upped the ante: "This is a good time for this quest for us in the northern half of the world - Spring is upon us :) Today I've been planting chillis (in a heated propagator) and preparing the ground for other plants when the soil has warmed up a bit. If you are in the southern hemisphere it's time to think about letting those plants go to seed so that you can collect and save them for next season! 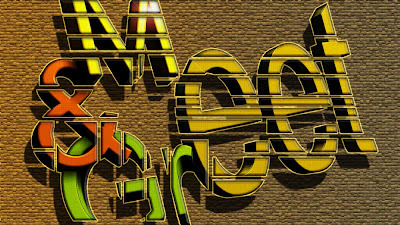 http://www.worldchanging.me/quest-tag/growing. Up the anti - what about for those of you that don't want to grow food - what about skipping straight to the harvesting with our foraging quests? http://www.worldchanging.me/quest-tag/forage. Free nutritious food is just there for the taking - now that has to be worth a few moments research to see what edible things grow in the wild near you!" Every year Alicia grows a garden and usually posts photos of her lovely herbs. And then she shares delicious recipes. Here's what she had to say about this challenge: "Oh we are so ready to be Gardening! I actually bought a pot of Basil the other day just so I could make some tomato Basil relish!. So we will be planting it as soon as the ground dries enough. We already have packets of seeds and are going to the local Herb Society's big herb and vegetable plant sale in a few weeks. They only offer locally grown plants and the farmers will be there to answer any questions on the plants. So excited to get started on our garden." Marla is still waiting for spring to arrive. Here's what she said: "I am so ready for Spring and getting outside to work the ground, but it's just a little too early in my area of the country yet. I am waiting and hoping I have some daffodils and tulips up for Easter. I love Spring when the world seems to awakening with life. I definitely do agree with you that we can eat healthy on a budget if we just take the time and effort to do it. Gardening is just around the corner but we usually can't plant anything in our area until at April." Charlotte dropped by and shared this: "Great challenge! Growing your own food is joyful, money-saving and sustainable. So get your hands dirty and have fun." She also wrote Start a Garden which offers readers great tips and ideas for container gardening ... perfect for balconies or small spaces. By the way, Charlotte is starting a great series on her blog called "A to Z". From A to Z she'll be introducing plants. Her focus will be on plants which grow well in Sweden but I'm guessing that many of them will be varieties which we, in the US, are familiar with. She'll not only be talking about planting and care, she'll be offering recipes. So head over and check out her first post and then, be sure to drop by often. Better yet, simply subscribe to her blog so that you don't miss an episode of this fun series. • Look for a way to share my excess produce (my local Buy Nothing Facebook group)—though I do preserve a lot for year-long use (still have pesto in my freezer from last summer). • Find more ways to preserve the food I grow. A friend will be teaching me the joys of dehydrating this year—KALE chips here we come! On a final note: Don't forget the flowers—to bring pollinators into your yard. A vegetable garden flourishes when your yard is a complete ecosystem. Check out my website at www.thegreenqueenofmod.com to find ways to encourage bees and other beneficial beings to call your garden home. There are a number of applicable posts under "The Green Garden" category. Happy planting—and EATING!" Lois knows, first hand, that getting kids involved in the gardening process has benefits. Here's what she had to say: "Like Alicia, I can't wait to get into the yard and start my garden. The more I learn about even the organic loopholes (such as antibiotics sprayed on fruit trees) I don't want to buy anything from a store. Now that I own my own land I am looking to add perennial plants along with fruit and nut trees that will pay off in years to come. You are so right about children eating what they help to grow. Last year in the apartment a couple of children asked if they could help and their mother was shocked when she saw her son eating peas right out of the garden. My grandchildren have also taken to eating foods they refused before when they grew them. I had enough space in the gardens that I gave them their very own sections and let them grow what they wanted. It was the first time my grandson ever ate salad, and only because he grew it. But they took it further by trying flowers such as dandelion, clover and others. When I moved it was the neighbor's children who asked if they could use my beds. I gave them seeds and showed them how to save the seeds of the foods still ripening in the beds to save money as their family has very little excess." Clare stopped by. She's an avid gardener and shares some interesting information about one common vegetable. Here's what she had to say: "Great challenge this week! I've been growing my own fruit and veggies for a while now - the fruit is great but I do battle with all the tropical insects for my veggies. I'm still trying though! Thanks to Andrea for reminding us to include flowers too! For me this week my challenge will be to look at other methods of preservation. Due to flooding and subsequent power outages, I lost everything in my freezer, which was pretty heartbreaking when I think about all the work that went into what was stored in there, not to mention the sheer waste. So I need to broaden my outlook. I don't enjoy pickled food but I'm sure there are other ways of storing, dehydrating, bottling etc. On a related note, if you're growing cucumbers, you might want to read "6 Uses for Cucumbers You Haven't Heard Of" on http://www.ecofriendlylink.com/blog/6-uses-for-cucumber/ - or, as @SoulfulLab so beautifully tweeted: Cucumbers are the new WD40!" Shopping Charity gave CTWW a nice mention and, if my memory serves, mentioned some of your articles. Unfortunately, I've been unable to get into their site so, give it a try and see if you can find CTWW. And thanks, Shopping Charity, for always thinking of us! The news on climate change isn't good. Polar ice caps are rapidly melting and conditions, around the world, are deteriorating. Recently, a report came out that California has only one year of water left. Since California provides most of this country with produce, their lack of water is a huge concern. Now, more than ever before, it's crucial to learn how to provide for ourselves. Food, in the near future, will become either unavailable or very expensive ... or, what we see in our markets won't be natural food but something fabricated in a laboratory. Growing our own produce ensures that we maintain nutrition. It also may end up being the way we survive. If you do a search for ways to improve nutrition, you'll find recommendations to add more fruits and vegetables to your diet and eat less meat. Eating more plant-based foods is also great for the environment because it takes fewer natural resources to produce plant foods as compared to animal products. And if you're thinking that vegetarians eat only raw carrots and celery, think again. There are millions of delicious plant-based recipes to try ... many of which will have carnivores licking their lips and begging for more. This week, go vegetarian for a day. That means no meat (beef, chicken, pork, fish, etc.). A vegetarian diet does allow for cheese, milk, and eggs if you wish. If you're feeling ambitious ... try adopting a vegetarian diet for the entire week! Go vegan for a day. That means strictly plant-based dishes ... no meat and no byproducts (milk, cheese, eggs, or honey). If you can do more than one day, please do ... the earth and your health will thank you! Are you a full-time vegan? Then your challenge is to eliminate processed foods from your diet this week. And, if you're feeling extra ambitious, please share a recipe and/or the benefits, to you, of a plant-based diet. Are you ready to go meatless and healthy this week? I know that you are! While standing in line at the county tree sale, people were talking about gardening. One conversation caught my attention. A woman, who recently bought a home, spent her first week's clearing the property. She cut the trees and bushes, burned everything, and was now repopulating her land. I suppose that it's human nature to want to put our own "stamp" on things ... to make them our own. And frankly, it's often easier to wipe the slate clean and begin anew. But when it comes to property, rash decisions can hurt both the earth and one's pocketbook. We made the decision to go slowly with our land, to discover the treasures it holds. It has revealed them bit by bit, almost as though it needs to get to know us before giving up it's bounty. In April of last year, we discovered mushrooms growing along our creek ... delicious edible mushrooms. When the trees lost their leaves in autumn and the underbrush began to die away, a small pear tree could be seen in a far corner of our lot. It still had the label on it and seems to simply need a little TLC to be productive. This spring we were thrilled to find creasy greens, the earliest of the wild, edible greens which are found throughout the Appalachian mountains. We also discovered a lovely Camellia bush and several flowering trees. Had we cleared the land, we would have missed out on these wonderful items. And here's another bonus ... finding thriving plants and learning about their growing habits has helped us decide on the right areas for other things like fruit trees and a vegetable garden. Plants and edibles aren't the only treasures here. Along the paths which wind through the property, previous owners displayed small statues, planters, and bird houses. They also stacked up building materials (bricks, lumber, windows, etc.). At first glance, because all of these things had been ignored for so long, they looked like piles of trash. But looking a little deeper revealed an abundance of usable items. This work bench was made from recovered wood. were recovered from the back of our property. Beautiful wood became Bluebird nesting boxes. Most of these projects cost us nothing but our time and effort. And there's something very special about using what's available rather than heading to the local hardware store for materials. All properties hold gifts. It might be wild edibles or fertile soil ... it might be items left by previous owners. But if we take the time to get to know the land, it will reveal it's special characteristics and treasures. That is the wisdom in waiting! Spring has finally arrived!! After a long, cold winter, I'm ready for warm weather, blue skies, and gardening. This time of year is perfect for sprucing up our green routine. And with these tips, you'll be well prepared for the warm months ahead! Join a CSA (Community Sponsored Agriculture) and try new fruits and vegetables. Most CSAs offer recipes so experiment and discover new and wonderful meals. Clean your home from top to bottom using natural, Eco-friendly cleansers. There are a ton of natural recipes online ... they are easy to make with ingredients typically found in the kitchen (vinegar, baking soda, lemons, etc.). Clean your bathroom fans once a year. Turn off the power and take the cover off. Wash it in soapy water. Clean the fan blades with a toothbrush. Open and close all windows. If they stick or don't open/close easily, check the weather stripping. Check outside hose faucets for damage. Turn the water on and place your hand over the opening. If you can stop the flow of water, it is likely the pipe inside the home is damaged and will need to be replaced. 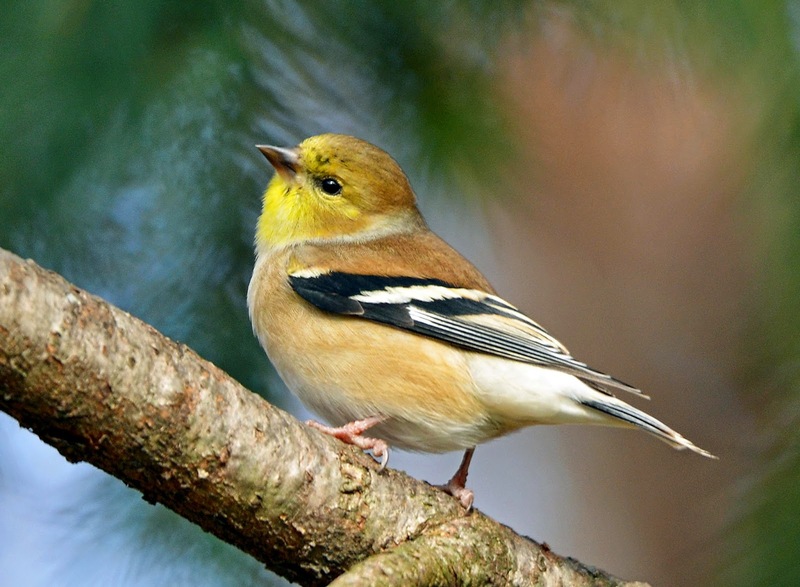 Clean Bird Feeders and Baths ... and make any necessary repairs. And while you're add it, put up a bee house. Now is a great time to start a seed swap, set up tool sharing with your neighbors, or organize a little free library. Start a compost pile ... it's great fertilizer for your garden and reduces food waste. Prepare for new growth in your garden. Rake leaves and winter debris. Use a hoe to loosen the soil and mix in compost for nutrients. Now's the perfect time to plant trees and bushes. Cooler temperatures and rain give them a good start. Check the garden hose for dry rot and replace if necessary! Use garlic to repel mosquitoes. Just cut the garlic and rub it on your skin. While this method isn't scientifically proven, many people swear by the practice. Did you know that sunscreens contribute to coral bleaching? Protect yourself from the sun, and protect coral reefs, by using natural, Eco-friendly sunscreens. And don't forget sunglasses, hats and umbrellas! Want more? Click HERE for last year's list of tips ... all tried and true! If you're moving into Autumn instead of Spring, you might be interested in Eco-Friendly Tips For Autumn 2014. 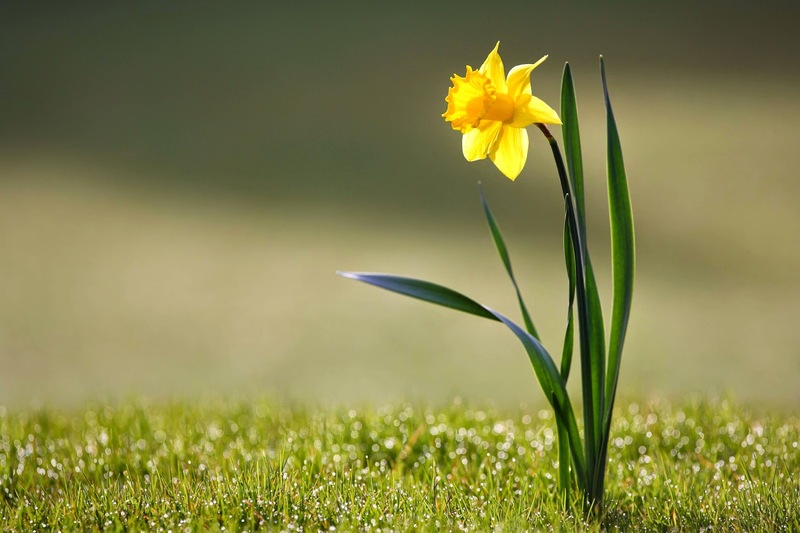 What's your favorite way to prepare for spring? 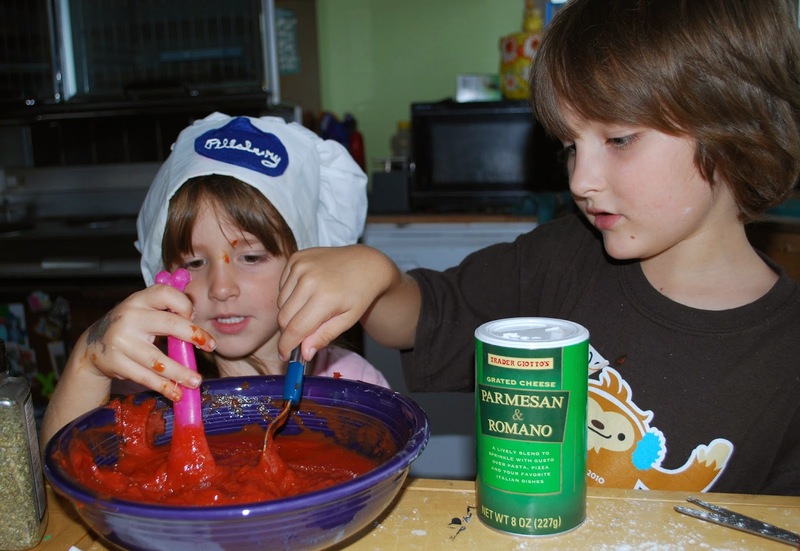 Last week we took on a fun challenge ... a family cook day! Here's an interesting fact: Research shows that family meals promote healthier eating – more fruits, vegetables and fiber; less fried food; and often fewer calories. I have great memories of being in the kitchen ... watching my grandmother, mom, and aunts working together to make raviolis; sitting at a table with my parents, cleaning fish; making traditional South American Christmas food with my mother-in-law, husband, and parents. Those times were filled with smiles, laughter, and fun. I learned about nutrition and developed a respect for ingredients. Enjoying a meal, which everyone had a hand in preparing, was special ... somehow, the food always tasted better! Charlotte wrote a wonderful post on our plastic challenge. In Plastic pollution she discusses how the oceans got to be a problem and offers 4 ways that we can take immediate action. In support of last week's task, she wrote Family Dinner, an excellent post where she talks about balance and knowledge being key methods to good nutrition. Kimberly dropped by and shared this: "Oh my…great post! Pinned and tweeted. Thank you for being part of our party. I hope to see you on tonight at 7. Lou Lou Girls"
Cooking with family is a long-held tradition for Alicia. Here's what she had to say: "Our children are grown now but when they were little I always included them in preparing a lot of things they ate. We home schooled them during the early years and when they were learning fractions I let them pick out recipes that had lots of measurements and this helped them in learning their fractions. Then they got to pick someone to give their finished product to and then they would grade them on the recipe. They loved doing this. Was lots of fun while learning at the same time. So our daughter and son both developed a love of cooking from an early age. Our daughter-in-law loves that our son is such a good cook and loves how he comes up with such delicious recipes! I now include our grandsons in the kitchen. We makes lots of wonderful nutritious snacks when they come to visit. They have such a good time doing this and always look forward to the fun things we are going to bake." 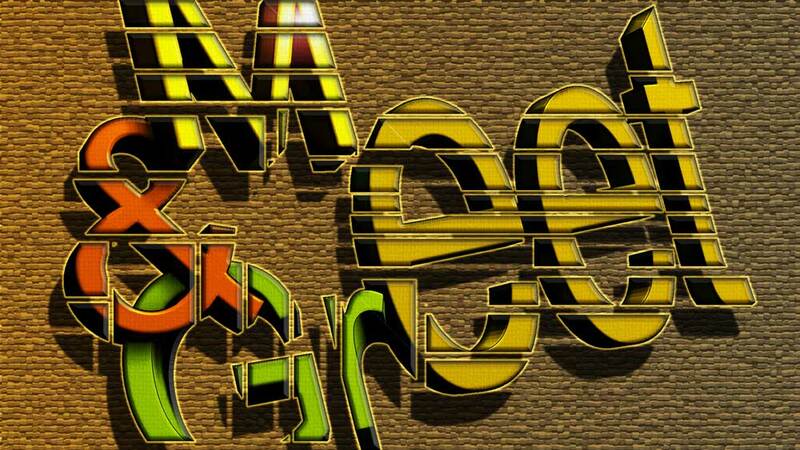 Morag accepted the challenge and shared this: "Nice challenges. I suspect I'll chat to my OH and see what nutritional changes we can make - there is always room for improvement! As for nutritional meals, ingredients, things to look out for on packaging or the best way to store food for max nutrition there are some ideas (in the form of quests) here: http://www.worldchanging.me/quest-tag/nutrition. Good luck everyone. Can't wait to hear what you get up to!" Marla checked into our Plastic challenge and shared this: "Plastic is one of the worst contaminants to our environment plus it is filled with some much toxicity to the body. I loved your article and all the feedback from others. It's good to know that people are becoming more and more aware of the dangers of plastic. I have very few plastic containers in my house. Use glass jars to store leftovers in that are recycled from products I bought and when I make food I either use glass or stainless. It cleans up so much better too and doesn't get those ugly stains on. I am slowing getting my husband away from plastic too." By the way ... our survey, this month, is all about nutrition so, if you have a minute, click HERE and tell us how you amp up your nutrition. We've assumed, in this challenge, that cooking with family includes the preparation of nutritional food. Unfortunately, that's not always the case. I've heard people say that they can't afford wholesome foods such as fresh produce when, for a dollar or two, they can buy a box of "helper". I personally believe that we can cook healthy meals on any budget. It takes a bit of planning and creativity but it is worth the effort. Not only is the food healthier but it is better for our environment. And that's an important life lesson to share with our family. One of the best ways to ensure proper nutrition in our food, and eliminate the threat of chemicals and pesticides, is to grow our own organic fruits and vegetables. Even those who live in small spaces can grow food in containers placed on a windowsill. It's also a fun family activity. And here's a plus ... picky eaters who typically refuse to eat their veggies have been known to love varieties which they had a hand in growing. This week, start a garden. This can be on a large scale, turning a substantial piece of land into a vegetable garden, or something small like a single pot of herbs on a windowsill. The idea, this week, is to start growing food. If growing food is just not for you, then your challenge is to either visit a farmer's market or sign up for a CSA (Community Supported Agriculture) ... click HERE to find a farm close to you. UP THE ANTI: Our friend, Morag, has challenged us to do a bit better on this week's activity. Here's her challenge: What about for those of you that don't want to grow food - what about skipping straight to the harvesting with our foraging quests? http://www.worldchanging.me/quest-tag/forage Free nutritious food is just there for the taking - now that has to be worth a few moments research to see what edible things grow in the wild near you! Will you accept her challenge? Are you ready to get your hands in the earth? I know that you are! At one time, I lived in Arizona. On weekends, wanting to get to know our new home, we explored the state. On one particular trip, as we wound down a mountain road, we came upon a fenced area with tons of warning signs. Do not enter, Danger, No Trespassing signs were huge and placed everywhere. The ones with a scull and crossbones made me shiver! We wondered what we had stumbled upon ... and whether we were someplace where we shouldn't be. I checked the map to be sure that we hadn't wandered off our course and determined that we were on the right road. Still ... it was rather creepy. As we drove on, we saw what all the fuss was about. We were driving by a working mine. What I remember, most, was the huge hole in the earth ... so large that huge trucks, running on roads which circled downward, looked like toys. It all looked like something straight out of a science fiction movie. I later learned that, in 2012, the US was the world's fourth largest copper producer, and Arizona was producing more than any other state in the country. Simply put, copper was, and remains, big business! I was invited to read Boom, Bust, Boom: A Story About Copper, the Metal That Runs the World by Bill Carter. Bill Carter lived in Bisbee, Arizona, a mining town and home to the famous Copper Queen Mine. Active mining operations ran from the 1880s until 1975. Bill, like many of us, decided to grow food in his backyard. And that's when trouble started. His fresh vegetables made him seriously ill. He later learned that his soil contained higher-than-allowed levels of lead. Worse, it contained 100% more arsenic than allowable levels. These toxins were a direct result of previous mining operations. This began Bill's quest to learn more about copper mining. A quest which has taken him all over the world and given him insights to both the problems and benefits of mining operations. Most of us are aware of at least some of the problems with mining. It destroys the land often leaving huge scars and holes in the earth. What you might find surprising is that there are legitimate reasons to continue extracting and using copper. Bill Carter is a true story teller. He takes what could be a very dry set of facts and turns them into an interesting personal odyssey. He writes with passion so that we feel his delight in starting a vegetable garden, his concern for the health of his pregnant wife, his affection for the eclectic people of Bisbee, and his distrust of the "new" soil in his yard. It was no surprise, to me, to learn that mining is hard on the environment and potentially deadly to humans. And I wasn't surprised to read how those who benefit, financially, aren't anxious to see the industry die. These aren't the big guys (although they are certainly protective of mining) but rather regular people doing regular jobs. What did surprise me is how prevalent copper is in our world. Copper is a natural inhibitor of decay. It is conductive, malleable and cheap, so it's used in a lot of products. For example, pressure treated wood contains copper. So do electronics, cell phones, cars, and our homes. Another surprise is that copper's germ-killing properties is making it a desirable surface material in hospitals. Using it for door knobs, bed rails, etc. may help prevent MRSA (Methicillin-Resistant Staphylococcus Aureus), a deadly staph infection which kills thousands of people a year. With so many pros and cons, I was afraid that the book would leave me feeling confused and powerless. Not so! Toward the end of the book the author suggests that it's not copper, itself, which is the problem but rather the way in which it is extracted and processed. He stresses the need to find alternate, healthy, and environmentally-sound methods of extraction. I think that this book has something for everyone. If you're interested in copper mining, you'll come away with a lot of good information. If you are concerned about the affects of mining on the environment and our health, you'll learn the facts. If you've ever debated the positive attributes of a material versus the negative cost of production, you'll find the conversations enlightening. 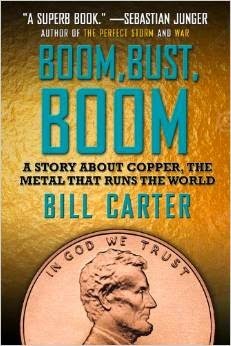 I enjoyed Boom, Bust, Boom: A Story About Copper, the Metal That Runs the World by Bill Carter and think you will too! To get your copy and learn more about the book, please click HERE. And, for an interesting interview with author, Bill Carter, please click HERE. I received a copy of "Boom, Bust, Boom: A Story About Copper, the Metal That Runs the World" in order to write this review. I received no other compensation. All opinions expressed are mine and mine alone and reflect my honest opinion of the material reviewed. Ready to meet this month's featured blog and blogger? For over 20 years, Marla has suffered from Multiple Chemical Sensitivities (MCS). If you, or anyone you know, suffers from MCS then you know that it's a tricky illness. There aren't tests which state clearly that the condition is present or that it is caused by a specific chemical. In fact, some in the medical profession don't consider it an illness at all. Consequently, finding a cure is often left to the individual. Marla started her road to recovery by cleaning up her personal environment. She started in her home, looking at things like carpet and air filters. She cleaned up her diet, opting for non-gmo foods. And then she moved beyond her home and took a look at how chemicals pollute our air and water. 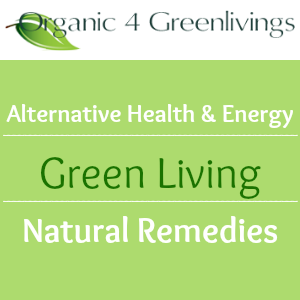 In Organic 4 Greenlivings, Marla shares her experiences and all the knowledge that she has acquired. Readers will find wonderful articles on natural ways to decorate a home, food allergies and allergies caused by things like latex, and how fragrance affects your health. I learned a lot from a couple of articles on organic gardening and growing organic strawberries in pots. I even found a great recipe for keeping a septic system healthy. Marla is also a co-host of one of my favorite blog hops, Real Food Fridays. What makes this link-up so special is that recipes must be free of GMOs, granulated sugar, food dye, high fructose corn syrup, and processed foods. The recipes shared are typically made from whole, organic foods. In other words, they are healthy! Organic 4 Greenlivings has become one of my favorite blogs. It is well written, down to earth, and filled with pertinent and usable information. Check it out ... I'm sure it'll become one of your favorites, as well! While researching nutrition, I came across a rather shocking statistic: Over 90% of U.S. adults are deficient in at least one vitamin or mineral. The problem is that while there is an abundance of food in our country, much of it is processed and full of empty calories. A calorie of food is simply a measure of energy and all calories are equal. What changes is the nutrient density ... the amount of nutrition we get from a calorie of food. 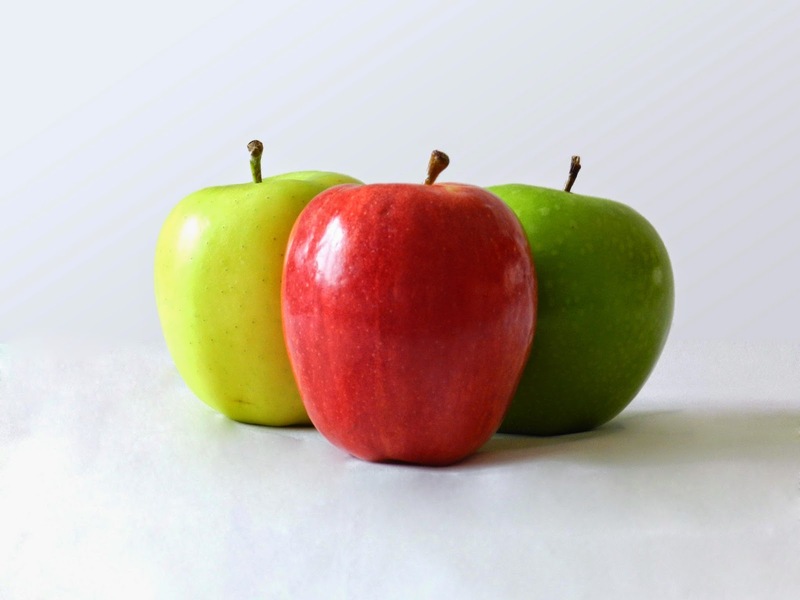 A medium apple has about 72 calories. It also contains fiber and vitamins. 1.8 teaspoons of canola oil has about 72 calories. It contains zero fiber, zero vitamins, and 2% saturated fat. The two foods have the same calories but very different health benefits. The apple gives you nutrition ... the oil does not. Join us on March 27th for the results. We completed our month of sharing resources, last week, by tackling textiles. When we moved to our new home, I thought it was a great opportunity to go through our closets and give away anything which wasn't being used. Donating them helped others and meant that we didn't have to move additional boxes. A win all around. This challenge, however, made me think about things like carpets. While living in an apartment, we noticed that each time a tenant moved out, the carpets were replaced. We asked the installers what happens to the old carpet and, unfortunately, learned that they were tossed out. Evidently, since most of the residents had pets, the carpets were extremely soiled. So, they were tossed. I realized that something as simple as keeping a carpet clean could mean the difference between reuse and waste. It's another example of how everything we do contributes to the whole. Andie is great at repurposing textiles. In Create a Drawstring Laundry Bag, she teaches readers how to reuse pillow cases. Brilliant idea! That's just one of the many ideas you'll find in this series of posts. She also left this comment for us: "This is what I live for! My blog features a number of posts with ideas for repurposing textiles, and I'll be tweeting out links with our wonderful #CTWW to spread the word. My favorite thing to repurpose is old top sheets and jeans—but any good fabric is fodder for my creations. I do donate quality items that are outgrown or no longer to our taste to our local senior center thrift store, but anything that is not up to snuff gets cannibalized for future projects: buttons are removed and saved (string them together with thread to keep the set), trim (lace, ribbons) is carefully removed with a seam ripper, ditto for salvageable zippers. The fabric is cut into useable pieces (bulky seams are cutaway), folded and stored or cut into rags. I also transform some items for a better use as costumes—it's amazing what can be created—or similar, more useful clothing. I have a tutorial on my site that shows how to make a sleeveless t-shirt from one with sleeves. Since I sew, of course I repair everything from split seams to lost buttons. I ever repair torn dog plushes! Textiles NEVER end up in a landfill from my house, that's fro certain!" Vicality encourages their readers to Keep textiles out of the landfill. Welcome back to Charlotte. I hope you enjoyed your trip!! She wrote Greener Gardening Tools, an excellent article where she shares information on garden gadgets. Ever hear of a solar irrigation system? She also shared Conscious Shopping which suggests that organizing our closets is a good way to keep textiles out of landfills. Charlotte lives in Sweden and the SSNC (Swedish Society for Nature Conservation) hosts a yearly clothes swap day. How great is that!! This edition of the Shopping Charity mentioned CTWW and included one of your articles. Hop over to see if it was your post! Alicia accepted the challenge and said, "I am a big advocate of shopping at thrift stores and donating to them as well. There is one store that if there is a spot ,tear or stain they put them into bags and donate them to an organization that gives them to people in need of clothing. Extra blankets and shoes as well as towels and coats can be given to rescue shelters. They are always in need of these things and are so very much appreciated! I also use old tee shirts and make reusable shopping bags from them. They are very sturdy and can be folded to fit in your purse easily without taking up much room at all." Fixing a garment is a great way to extend it's life. The folks at WorldChanging.me created a quest for fixing stuff, including garments. Check it out HERE. What about mattresses and shoes. Clare took on these items and shared this: "My textiles get reused - towels into face cloths, tops into shopping bags, hats, scarves and more. That's a pretty horrific statistic, that just 15% of discarded textiles get recycled in the US! Of course Reduce and Reuse come first, but if you get to the Recycle stage, it can be useful to know that mattresses are chock full of great recycleable materials, and they're easy for you to recycle too - http://www.ecofriendlylink.com/blog/5recyclingfacts/. And while you may not feel comfortable donating your old shoes, did you know that they may help a child go to school? It's a fascinating insight into schooling in less privileged countries - http://www.ecofriendlylink.com/blog/recycleshoes/. Thanks Small for another great CTWW challenge - as always I'm reviewing how I can improve." Lois is big on repurposing and if you haven't discovered her talent yet, be sure to head over to her blog ... she's very creative!! She shared this with us: "We are so quick to toss out anything not perfect. Nothing gets tossed out in my home and I often blog about the items I have repurposed from old textiles. My current projects I need to finish are updating my winter denim coat with denim I saved from the trash in areas that are worn from age, converting an adult's dress into a child's dress with purse, and my son just dropped off a pair of pajama pants that are too worn in areas to be of use to him. I'll cut it up and make something to wear for the children out of the usable pieces. Any fabric not good enough to be used for its intended purpose and not large enough to be made into something else of use is cut down to be used for wash cloths, dish cloths (haven't bought a dish cloth in years) or for rags when all else fails." Can you think of a good reason why textiles couldn't be reused or recycled? I find it difficult to come up with even one. In most cases, textiles are usable. They might need some repair or cleaning, they might even need to be shredded and upcycled into something else. But they can be used. They are a preventable waste. The fact that they take up a huge percentage of landfill space leads me to believe that our society has become complacent and lazy. Why else would we toss perfectly good items into the trash bin? We can prevent this kind of waste and help others in the process. So let's do so! A pristine ocean - sounds perfect, right? It may not, however, be what it seems! This month we're addressing nutrition. The ocean is a valuable source of food. Humans throughout the world enjoy seaweed, fish, shellfish, and even algae. These low-fat foods are high in nutrients. 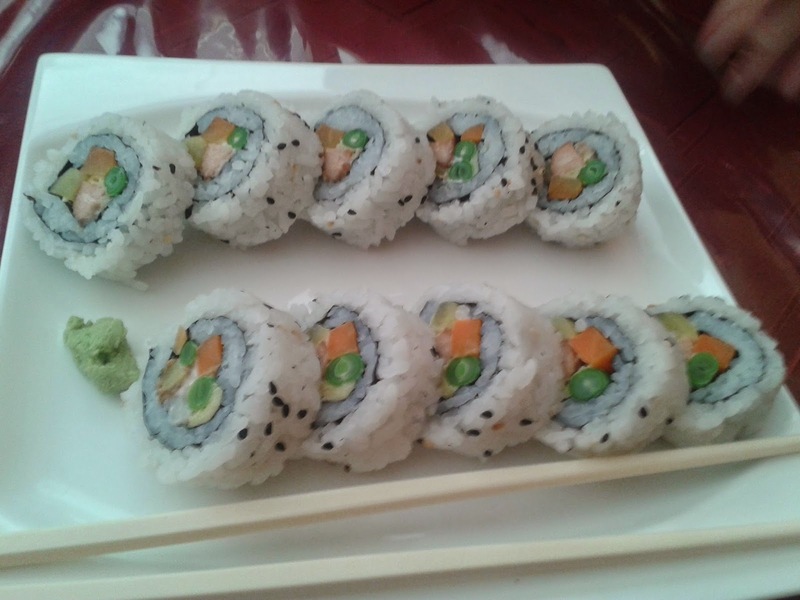 For example, seaweed is a good source of Vitamin A, Vitamin C, Vitamin E (Alpha Tocopherol), Vitamin K, Niacin, Pantothenic Acid and Phosphorus, and a very good source of Riboflavin, Folate, Calcium, Iron, Magnesium, Copper and Manganese. Fish and shellfish provide protein and a good amount of potassium. Unfortunately, the ocean now contains huge amounts of plastic which have degraded into very small particles. These particles, and the harmful toxins they contain, have entered our food chain. Direct toxicity from plastics comes from lead, cadmium, and mercury. Simply put, we are ingesting contaminated food. Eliminating all plastic from our lives is probably impossible. But we can certainly eliminate some! If you need something which comes in only plastic (computer monitors, cat litter boxes, etc.) consider used items via Freecycle, Craigslist, or a second hand store. If you eat meat, bring your own container to the butcher department at the grocery store rather than buy it wrapped in plastic or butcher paper. Butcher paper, once coated with wax, is most commonly coated with polyethylene, a plastic. When ordering a pizza for delivery or take-out, ask them not to use the plastic package saver (that little plastic gadget which is placed in the center of the box to keep the lid off of the pizza). Do you really need a salad spinner? Avoid plastic by using a dish towel, cotton produce bag, or even a pillowcase to "spin" your lettuce. Get the kids involved and suggest they head outside to be human sprinklers ... spin, baby, spin! Use stainless steel pet bowls instead of plastic. Ever notice how restaurants automatically place plastic straws on the table with your drink? Ask the server not to leave them on the table and drink straight from the glass (the old-fashioned way). Here's a tough one ... ice cream containers typically contain a plastic lining so, don't buy it. If you want ice cream, opt for a cone or bring your own container to a quality ice creamery. Do you enjoy chewing gum? Here's a shocking fact ... it contains plastic. So, give it up! Avoid liquid dish and laundry detergent, hand soap, and shampoo ... all of which come in plastic. Instead use powdered detergents which come in boxes, bar soap, and bar shampoos. The idea this week is to find new ways to avoid plastic ... which keeps it out of the oceans ... which keeps it out of our food chain ... which ensures that we get all the nutrition and none of the toxins. Are you ready to protect our food? I know that you are!